When moving houses, it takes a few days or sometimes weeks in extreme situations for your dog or puppy to settle down and feel at home. Dogs are really sensitive, and most of the time react negatively when shifted to totally new surroundings because they are used to the safety they find in the previous place, basically just like humans. There are a variety of techniques recommended by vets and pet experts that can be used to calm your dog down before, during and after a house move. These techniques include taking efforts to ensure that your dog’s day to day routine remains the same. Dogs are calmest when they have a known and predictable set up. House move usually disrupts this happy bubble of theirs; the cardboard boxes, strangers walking and moving things around messes their routine and this makes them anxious and panicky. Taking action to stick to the same routine is sure to help. For example if your dog is taken on a walk in the evenings, try your best to stick to this schedule. Another commonly used technique is the crate training method. Dogs are primarily den animals and adore having their personal space to hide from loud noises and to rest. Dog crates appeals directly to a dog’s primitive survival instincts. In a dog’s mind, the den is acknowledged as a safe zone. By crate training your dog, it ensures the dog can go to the crate when it is anxious or nervous to calm down. When you’re moving houses, you can transport the crate to the new house to give your dog a sense of familiarity and security. 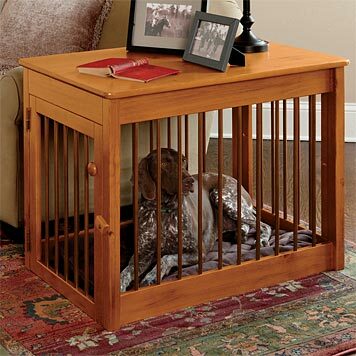 Dog crates are also helpful when you can’t be around as they keep your dog without him getting into any trouble. Quite a number of dog owners refuse to crate train their dogs because they feel that the confinement is harsh and cruel, but experts agree that a crate gives dogs a sense of security and peace. When crate training is effectively done, it has numerous benefits for dogs and dog owners alike; it includes house training, teaches your dog to calm down, prevents any appearance of any destructive behaviors, teaches the dog to control its excretory system and reduces the mess around the house. See this post if you are looking for a nice cage for your dog. Dogs should be eased into crates gradually. It is a process that takes a lot of your free time and need plenty of effort. Simply dumping your dog into a crate for a long time will not work and might have negative effects on the dog’s mental health. Encourage your dog into entering the crate by enticing him with a treat. Add a blanket your dog frequently uses and is familiar with. Gradually start feeding your canine in the crate with the door open and once he is used to it, close the door for a while. Gradually increase the time you keep the door closed. The main thing about this training is to make sure you do not push your dog too fast, let the training continue at its pace.